Jim & Chrissy: Vow or Never Will the Hip Hop Couple Finally Tie the Knot? “I think that we should get married.” Recently, WE tv announced their new series Jim & Chrissy: Vow or Never will premiere in September. The reality series follows the engagement of hip hop power couple Jim Jones and Chrissy Lampkin, who have been together for 11 years. Jim & Chrissy: Vow or Never premieres on September 1st at 10 p.m. ET/PT. 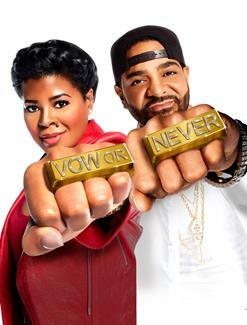 New York, New York (August 5, 2016) – Rapper Jim Jones and his longtime fiancée Chrissy Lampkin are back on reality television in the new series “Jim & Chrissy: Vow or Never” premiering Thursday, September 1 at 10:00 p.m. ET/PT on WE tv. The show follows the ride or die couple as they spend time in one of their favorite cities, Miami, finally deciding that it’s time to make it official and get hitched. However, when Jim suggests having the nuptials live on national TV for the world to see, Chrissy begins to have serious doubts, especially given that their infamous engagement has been on and off for the last five years. Jim and Chrissy have been together for more than a decade, have each other’s backs and consider themselves best friends but that might not be enough to keep this couple from being pushed over the edge by meddling friends, a longstanding family feud and the pressures that come with planning a wedding. The road to the altar is going to be a very bumpy ride which begins with Jim missing the couple’s first appointment with their wedding planner to party. And then there’s Jim’s mother, Nancy “Mama Jones,” who’s always had a difficult relationship with Chrissy, and decides to fly to Miami unannounced because she’s heard rumors of an impending union…and she’s not having it. Catch “Jim & Chrissy: Vow or Never” Thursdays at 10:00 p. m. ET/PT on WE tv to see how this journey ends. More about: Jim & Chrissy: Vow or Never, Jim & Chrissy: Vow or Never: canceled or renewed?, WE tv TV shows: canceled or renewed? I luv Jim & Chrissy..I hope they get married on tv for the world to see and or dont..